For photographer Caitlin Teal Price, 2010 initiated a profoundly transformative time, both personally and artistically. Returning to Washington, D.C., after years living and working in New York City and then earning her MFA at the Yale School of Art, she fell in love, married and became the mother of two sons, now six and four. Her newest works, on view at the Greater Reston Arts Center through Nov. 24, are a visual “memoir” of her journey as a mother at the same time she was recapturing her productivity as an artist, living and working in a new environment with a whole new set of quotidian demands. Known for her photographic collections of people and places, these new works focus instead on objects (twisted spoons, bits of metal, porcelain and plastic)—randomly collected by her sons on regular walks together. Although much different subject matter than her earlier people-oriented works, there are connections. Akin to still lifes, they likewise are carefully constructed portraits. Similarly, they also employ a distinctive use of crisp, intensely present light and shade. “Photography is writing with light, and you’ve always used it well. … You almost forget it’s a photograph,” said Lily Siegel, GRACE executive director and curator. Now working with a digital camera, Price, looking to the future, suggested that she might return to the darkroom. “I found speed, but I lost process … the idea of labor,” she said. The exhibition also includes three of Price’s first abstract works—two large-scale minimalist drawings, created with pigment and X-Acto blade, and a striking wall sculpture, “Circadian Drive,” constructed of 35 small, interconnected tiles (small enough for her to put in a bag and work on wherever her daily life took her), also created with pigment and X-Acto blade. Compared by Siegel in concept to David Hockney’s 1980 “Mulholland Drive: The Road to the Studio,” in which Hockney painted his daily drive from memory, Price, in “Circadian Drive,” drew the repeated drive to her sons’ daycare with her eyes closed. While Hockney’s colors are “jubilant,” Price’s are a more subdued grey, black and white, extracted from a photograph of a rosemary bush along the route. This was Price’s second formal conversation with Siegel about her art work. 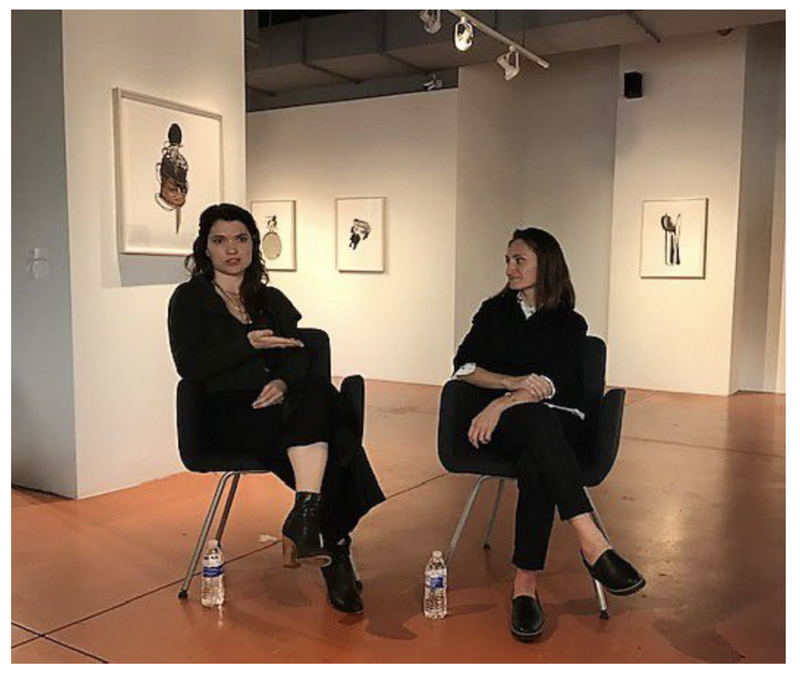 On Oct. 7, Price and Siegel talked about her new work and the GRACE exhibition with photographer and video artist, John Pilson, at the National Gallery of Art. Pilson also is senior critic and acting director of graduate studies for fall 2018 at the Yale University School of Art.